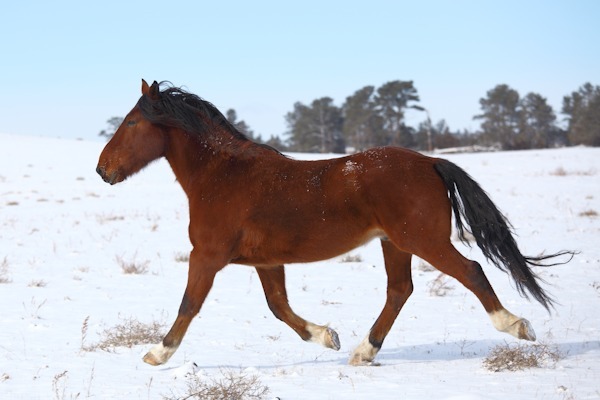 Tourists visiting the Black Hills Wild Horse Sanctuary frequently comment about a handsome bay gelding that stands a few hands higher than the other mustangs in his band. “That’s Cisco, our gentle giant,” we tell them. It’s easy for another mustang to hide behind Cisco, our gentle giant. 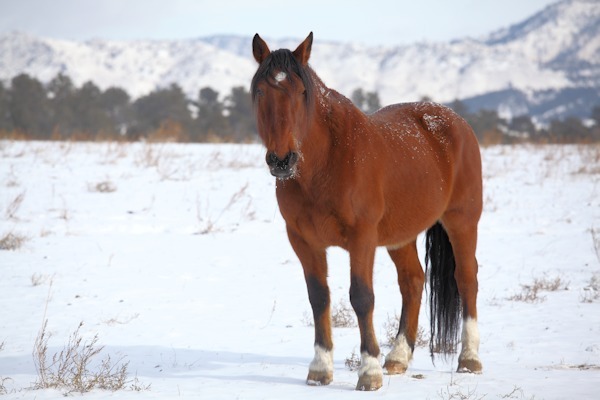 The Black Hills Wild Horse Sanctuary: a big place for a big horse! 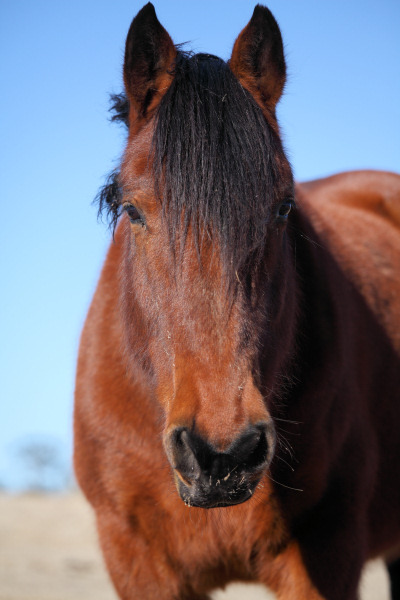 Our gentle giant almost never made it beyond a BLM auction, because a feedlot buyer purchased Cisco for slaughter. Cisco owes his life to a caring person, Celine Myers, founder of Duchess Sanctuary and Ark Watch Foundation, who came and purchased Cisco the day before Cisco was scheduled to be loaded on a truck and sent to a Canadian slaughterhouse. 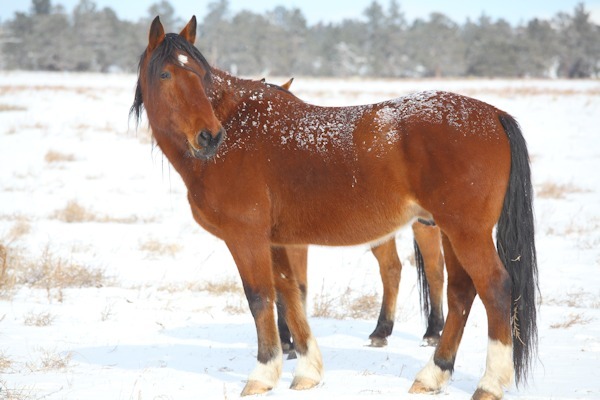 Celine sent a plea to Susan Watt, director of the Black Hills Wild Horse Sanctuary, to adopt Cisco. The 1,600 pound seven year old arrived at his forever home in 2012. Not much is known of Cisco’s past. His auction paperwork says he was rounded up by the BLM from the Owyhee Wilderness Study area on the Oregon/Idaho border. There is speculation that he was used as a bucking horse, but if he was there’s good chance he wasn’t mean enough to remain a bucking horse. Cisco’s gentle nature can easily be seen with his behavior towards the other horses in his band. He carries himself proudly, but with soft and graceful movements that rarely offend the others around him. It’s as if he knows his large size requires him to move with care and consideration when near other horses. He’s not one to be food protective, but doesn’t get pushed out of the way either. He’s a model of social skills in his horse hierarchy. But for all his gentle nature, he can run like the wind and his heavy thundering as he races by is a joy to behold! When Cisco runs by the earth moves! 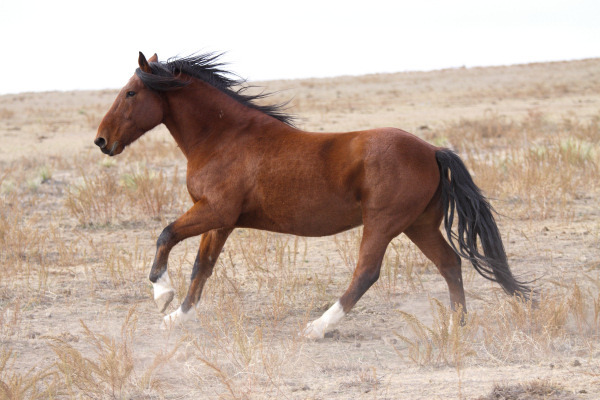 The chances of seeing him run are good, because Cisco shies from human attention and will start moving away when approached; if he feels a human’s attention stays too long on him, he will break into a run across the fields. His running infects the rest of the herd, so many times the 30 to 50 horses in his band join him, truly an impressive scene to experience! Cisco, our gentle giant, is a wild horse at heart. His loss would have been our loss. If you would like to help Cisco, please give the gift of hay so Cisco can continue his running wild and gentle ways.